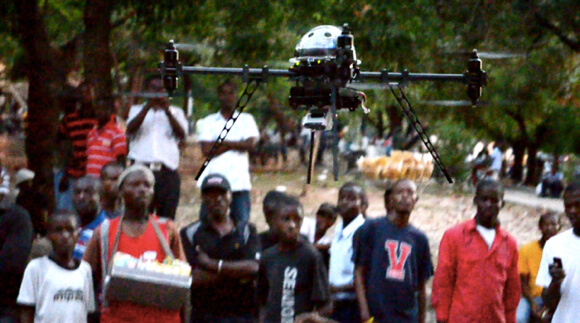 Last summer, drones took to the skies over the Dominican Republic and Haiti. These flying bots weren’t on a military mission, nor were they conducting police surveillance. They belonged to audacious Singularity University Labs startup, Matternet. Matternet wants to leapfrog road infrastructure in developing countries by building a futuristic Pony Express—with drones. Whereas the internet is an information transporter, the “matternet” will transport…well, matter. 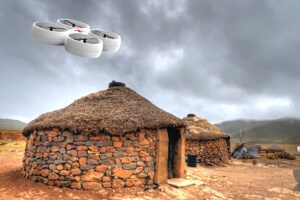 These robotic “drones for good” will fly food, medicine, and other essentials to villages seasonally stranded by stormy weather and low quality road infrastructure. Singularity Hub recently spoke with Paola Santana, Matternet co-founder and Head of Regulatory Strategy. Santana told us the idea of the Matternet dates back to Singularity University’s 2011 graduate studies program. A group of SU students looking at the causes of poverty concluded being locked in the cycle or breaking free is strongly influenced by access to basic goods and services in the marketplace—and access requires roads. Problem is, road infrastructure is expensive and inflexible. It could be decades before many rural areas get reliable roads. 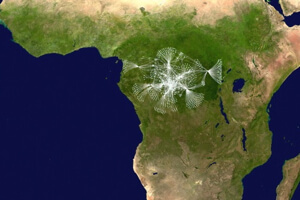 Might there be a way to leapfrog road infrastructure in developing countries like mobile leapfrogged telecommunications infrastructure? Why not take to the sky? Drones are cheap, relatively easy to build, and can be autonomous. It seemed an elegant solution, but the group soon realized drones alone wouldn’t do the trick. Andreas Raptopoulos, Matternet co-founder and CEO, says, “We wondered, how do we leapfrog roads if we can’t carry much stuff and only have a 10 km life for our battery? Let’s do a network.” Raptopoulos, Santana, and two other Singularity University graduates—Dimitar Pachov and Darlene Damm—decided to organize a startup. Matternet the idea gave birth to Matternet the firm. Matternet’s drone network has three key components. First, the drones—custom-built autonomous electric quadcopters with GPS and sensors, capable of carrying a few kilos up to 10 kilometers (and more as the tech advances). Next, the firm will set up a network of solar-powered charging stations where drones autonomously drop off dead batteries and pick up charged ones. A drone battery that can travel 10 km need not limit the drone itself to 10 km—rather, these drones can theoretically travel the whole network by swapping out batteries. 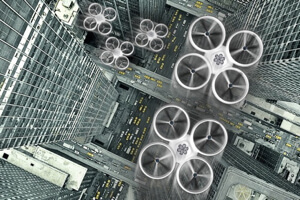 The final component will be an operating system to orchestrate the drone web, share information with aviation authorities, and fly missions 24/7/365. It’s a lovely vision, but where is Matternet now? The firm has funding from Silicon Valley VC Andreessen Horowitz, and Raptopoulos will present at TED Global on June 11. Meanwhile, their first drone has flown autonomous point-to-point trials in the Dominican Republic, Haiti, the UK, and at NASA’s Moffett Field in the US. Of course, there may be a few technical hurdles. We asked, if the drone network is most useful when monsoons cut off the roads, then might the network’s solar power be limited during peak usage? Or might the stormy season’s wind and rain ground the quadcopters too often to be useful? Perhaps, but these aren’t insoluble problems. Matternet could power their stations with hydro (although it can be finicky), wind power, or even strategic use of the grid in key locations. And the drones themselves will improve with a little innovative engineering and advancing tech—likely both. The greatest challenge may be preparing the air politically. Why? “Because,” Santana says, “Nobody’s set up a drone network before.” It’s a simple truth all inventors must face—innovation may happen years before it can be realized politically. Commercial drone use is currently illegal in the US. The Federal Aviation Administration (FAA) is required to establish the ground rules and open the skies to commercial drones by 2015. The topic is now and will likely continue to be a touchy subject. Santana thinks it’s important to tell folks, especially in the US where drones have a negative image, about the potential good robotic aircraft can do. “You can use drones for filming, for agriculture, for protecting animals from illegal hunting, for transportation.” But it’s also imperative to write good regulations, establishing what you can and can’t do with drones. Looking ahead, Matternet believes drone capability will follow the exponential curve—soon carrying more stuff longer distances. And whereas the firm may first find its feet in rural areas of developing countries, it may eventually be equally useful flying over congested roads in megacities. Beyond that? Maybe Matternet and other commercial drone operators will prepare the skies for more traffic. That is, maybe we’ll arrive at those flying car dreams obliquely, starting with a few quadcopters delivering small packages—and scaling up from there.